Today, Facebook launches a new way to buy and sell goods online -- Facebook Marketplace. While the service may not win any prizes for the originality of its name, it provides a more efficient and effective way to find things that are for sale near you than currently exists on the social network. 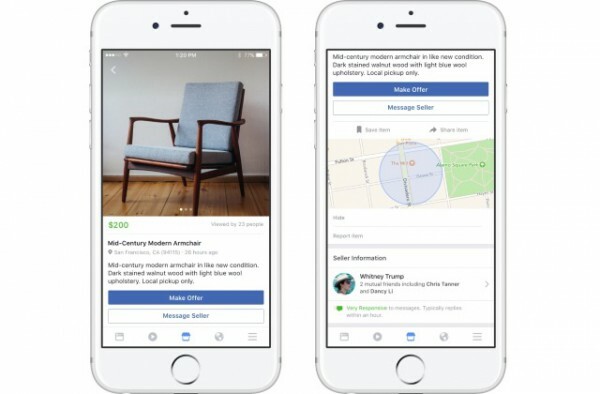 To start with, Facebook Marketplace will be available to mobile app users on iOS and Android, but it will also come to Facebook on the desktop eventually. Facebook is taking a very hands-off approach to buying and selling, and is not getting involved in the murkier aspects of transactions such as payments or handling feedback. The primary aim of Facebook Marketplace is to keep things as simple as possible. Both listing and searching for items is incredibly easy, and the focus is on putting would-be buyers in contact with sellers as close by as possible. The new feature sits alongside the many existing pages that have been set up to facilitate the buying and selling of goods, and Facebook has made it possible to post items to the Marketplace and individual pages simultaneously to help maximize your audience. Facebook is where people connect, and in recent years more people have been using Facebook to connect in another way: buying and selling with each other. This activity started in Facebook Groups and has grown substantially. More than 450 million people visit buy and sell groups each month -- from families in a local neighborhood to collectors around the world. To help people make more of these connections, today we’re introducing Marketplace, a convenient destination to discover, buy and sell items with people in your community. Marketplace makes it easy to find new things you’ll love, and find a new home for the things you're ready part with. We’ll continue to build new options and features to make this the best experience for people. Facebook Marketplace launches in US, UK, Australia, and New Zealand to start with, but more countries will be added to the list in the coming months.